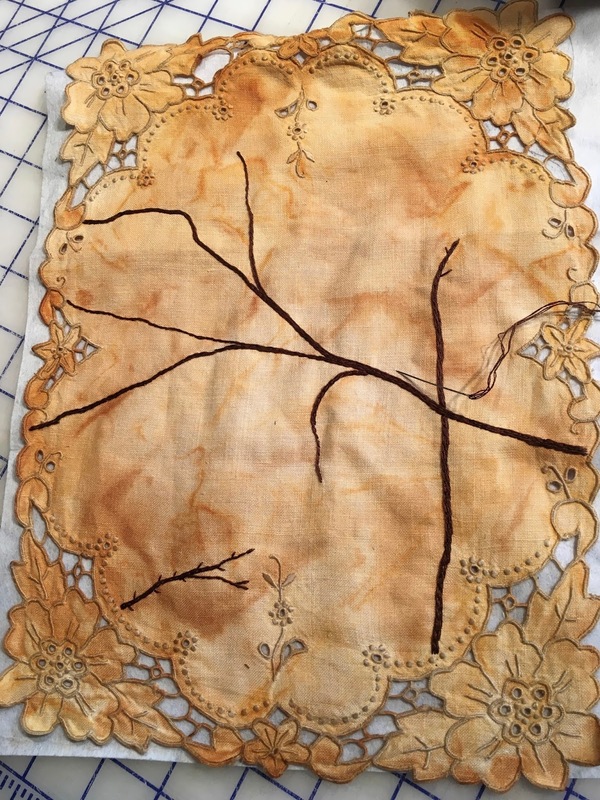 Back in 2015, two pals and I tried our hands at eco printing. 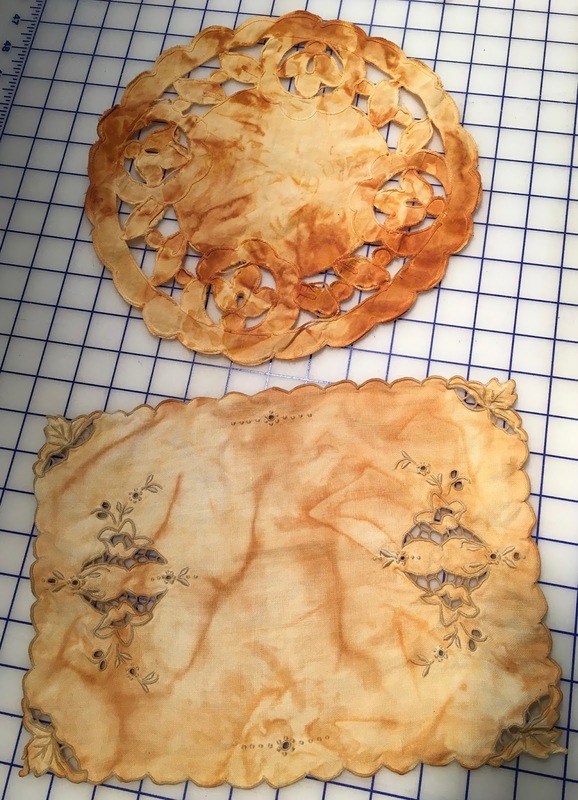 After mostly disappointing results, I decided to abandon the idea of printing with leaves and instead to process some vintage textiles that I'd brought along in an iron water bath. They were squeezed into fabric balls, contained with string and simmered for about an hour. 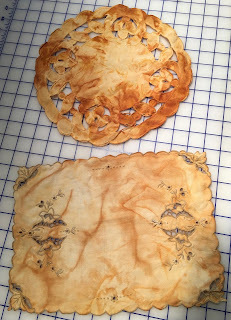 I can't tell you how many times I've pulled them from my stash, only to put them back after being unable to move forward with a workable design on their small size, about 9" x 10". Finally it came to me.....perhaps they could be transformed and then mounted on pieces of dyed silk noil or ???? Why did they have to be stand alone....which was my original thought?!? Of course every bin and stack of fabric I own was gone through before finally settling on an approach. This piece is still in the works......so it will be interesting to see what the final decision turns out to be. 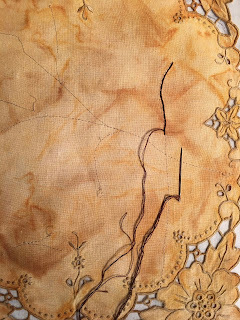 A lot of thought went into how to stablize the embroidered/lacey textile and yet retain the details. Pellon non-fusible light-weight stabilizer, as is often my choice, was placed on the wrong side of the piece. I plan to cut away all exposed sections beyond the center section where the motifs will be placed. 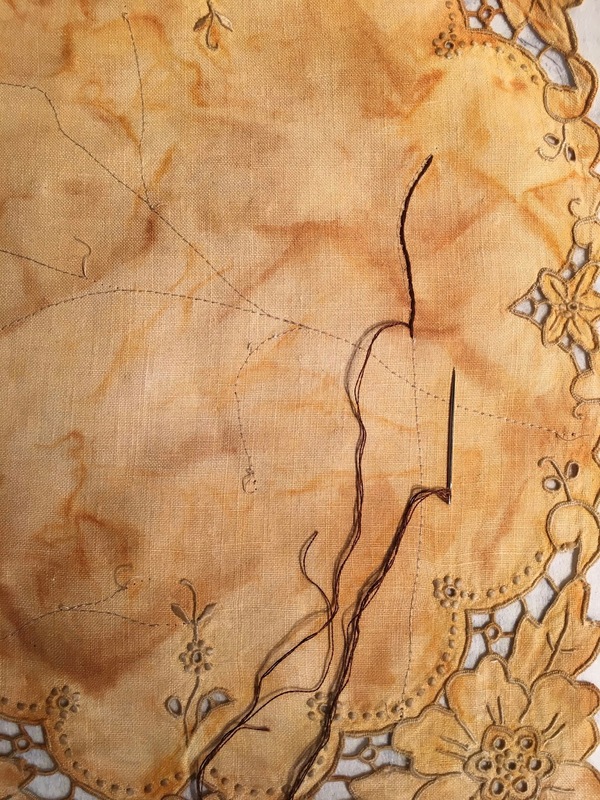 The biggest hurtle was developing a way to transfer the design lines to the fabric! The use of pencil or other such tracing material was out......too risky in case I changed my mind about location etc. Removing those marks may prove to be impossible. 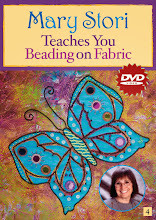 Here's what I came up with.....borrowing a transfer method I often employ when beading. 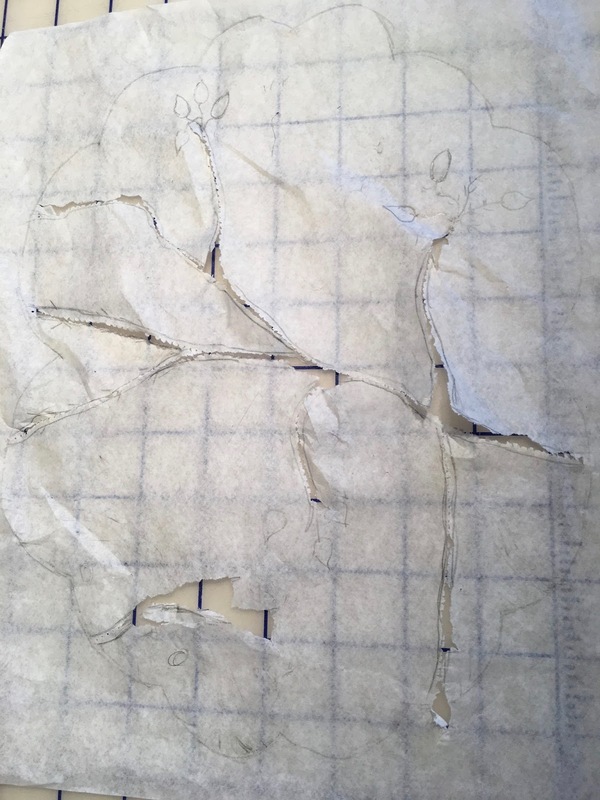 With tracing paper over the hankie, the outline of the center section was recorded. Next, I spent a good amount of time auditioning small scale foliage designs within the marked boundaries using pencil and eraser. 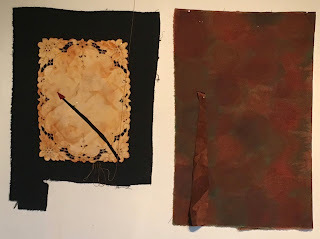 To transfer the final design to the hankie, the paper pattern was positioned on the right side of the fabric and secured with small silk pins. 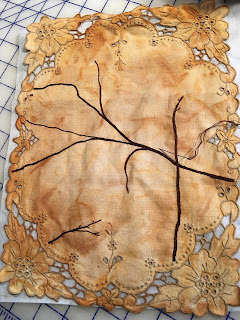 With thread to match, I machine stitched a line down the center of each branch. 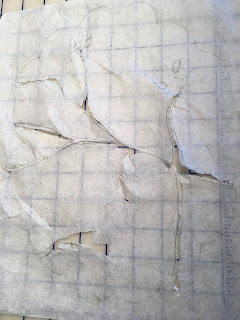 Carefully the paper was torn away, revealing a guide for the hand embroidery. Check out these links to explore what other artists have been working on this week: Nina-Marie's Off The Wall Friday, Sarah's Whoop, Whoop Friday, Crazy Mom Quilts. Great tips about marking! Looking forward to see the progress. Your piece is beautiful! How wonderful to be able to use up a fabric you thought was a lost cause. 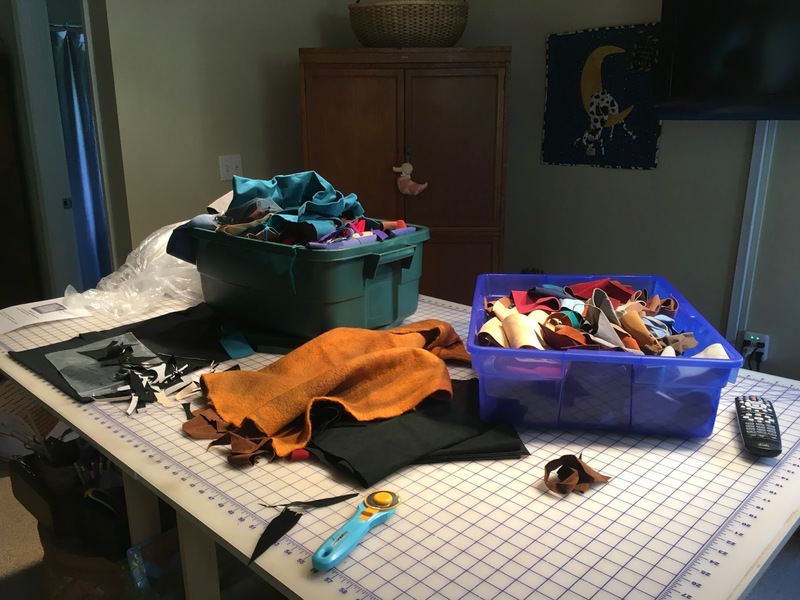 Thanks for sharing, looking forward to hear more about the process! Vintage linens are so tricky to use. Looks like this one will be very lovely! I just commented on your more current blog post...I'm a few days behind! Love what you ended up doing with this piece!!! LOVE IT! I enjoyed your process and coming to a solution. That is often joy/agony but part of what makes us fabric explorers! I am fond of vintage fabric and use it when i can. Imagine if it could tell a story; then we must be the next chapter. i like where you arrived.